Controversially, I think the Hotel Transylvania series is one of the most consistently hilarious and entertaining franchises in cinema today. I know, I’m a terrible person. And honestly, everything about Hotel Transylvania is a huge turn-off. Adam Sandler and Kevin James being two of the leads should be enough to keep me well and truly clear of these films. And yet, something about them keeps bringing me back. For those of you who haven’t seen any of the films, the franchise follows Dracula (Adam Sandler) and his group of friends – Frankenstein’s Monster, The Invisible Man, The Wolfman, etc. – who run a hotel together for all the monsters and beasts of Transylvania. Also living in the hotel is Dracula’s daughter Mavis (Selena Gomez) and her boyfriend, the human Johnny (Andy Samberg), much to Dracula’s annoyance. The films have basically followed preposterously simple plots with plenty of room for non-stop puns, sight gags and references, colourfully animated and surprisingly well performed by the cast. The films are a riot, I don’t care what anyone says. But who cares about the plot. Much like a Marx Brothers comedy, it’s actually pretty irrelevant. The Hotel Transylvania films are renowned for the non-stop jokes firing on all cylinders, meaning even if some of the jokes don’t land, you don’t have to wait long for the next one. It’s a constant onslaught of silly jokes and references to iconic horror films, and should be prescribed as medication to anyone with the blues. If this doesn’t cheer you up, nothing will. The animation is stellar, too – Sony Pictures Animation’s jerky movements and wonderful colour palette make for a very comic feel to proceedings, while the film’s soundtrack includes some freshly-written bangers from Tiësto that make up the film’s hilarious final battle – a DJ duel between good and evil. 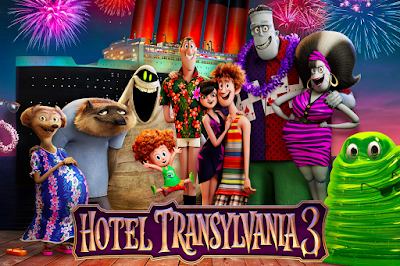 All in all, Hotel Transylvania 3 is a hilarious addition to the brilliant franchise and if you don’t agree with me, we can’t be friends. Sure, they’re not Disney quality, but they’re bloody great. Then again, I absolutely loved The Boss Baby, so I’m probably not a very good judge of quality these days… Hotel Transylvania 3 is a quick-fire laugh-fest with slick animation and great voice performances.